I Am The Crappie Queen!!! I didn't know the importance of a big crappie until all of my friends told me I had a large fish... It weighed 5.7 lbs on a fish scale weigher. I caught this fish in a reservoir in Arkansas. She was a fat fish. lol I still have her in the freezer and now I want her mounted!!! 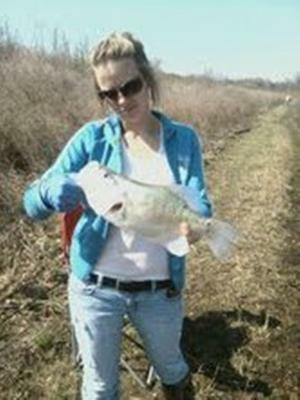 Jason's response: Wow Angela, what a nice big crappie. Great job on catching that slab! It would definitely be cool to see that fish mounted. Please keep us updated when you decide to take it to the taxidermist. I could edit this page for you to include a picture(s) of your mounted crappie. You can let me know by commenting here, or by using the form on the contact page, or by submitting a new contribution to the crappie pictures section. Again, awesome job on landing that monster crappie! P.S. Angela, I checked into this a little more because I got curious to see how far off you could be from having a state record crappie. If that fish weighs as much as you claim, then it seems like you have the new world record. Naturally, fish lose weight right after they're caught and the longer that they're held from their natural environment. But, you may want to look a little further into this yourself to see what you really have there.